Capturing a crucial moment in the history of exploration, the mid-19th century romance with the Arctic, Andrea Barrett focuses on a particular expedition and its accompanying scholar-naturalist, Erasmus Darwin Wells. Through his eyes, we meet the Narwhal's crew and its commander - obsessed with the search for an open polar sea - and encounter the far north culture of the Esquimaux. In counterpoint, we see the women left behind in Philadelphia, explorers only in imagination. Together, those who travel and those who stay weave a web of myth and mystery. And they finally discover - as all explorers do - not what was always there and never needed discovering, but the state of their own souls. Riegert's performance, Encore. I purchased this book on the strength of Riegert's reading of The Yiddish Policeman's Union. Erasmus Wells life as a shy naturalist comes to life in this telling. 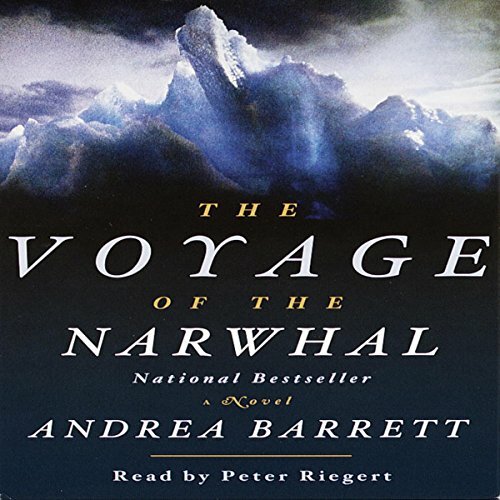 Would you consider the audio edition of The Voyage of the Narwhal to be better than the print version? No. Andrea Barrett is a fabulous writer. I have read and loved all of her books, but this narrator ruined the book for me. The narrator is an educated scientist from Philadelphia, not a hood from the NY streets. In addition, the narrator had no ability to represent the voices of other characters!! Who would you have cast as narrator instead of Peter Riegert? Anyone who didn't have a strong New York accent.